How's your writing going? Anything I can help with? Don't be shy. I'd love to help. That's why I write this blog. As a published writer, I still have my struggles too. But I feel that in three-and-a-half months, if nothing goes wrong, I should be able to retire. Once that happens, I should be able to do more writing. Right now it's tough trying to get in the mood during my 1-hour lunch breaks 3 or 4 days a week. With that consideration, and my struggle to overcome my huge writer's block, my writing ain't goin' as well as I'd like. See, like I said, we published writers have trouble writing as well. Here's my problem right now. I have 7 main characters, each with their own individual problems, subplots if you will, and I can't decide how to tie them all together. Based on the word count, I'm probably less than half way through the book, so I have room to do with my characters what I want (or more likely let them do what they want) . I've found, however, that I do my best writing when I'm bored, ha ha. Can you feature that? But it works, and may work for you, because that's when I let my thoughts wander -- or you can call it daydreaming, and daydreams are where my fiction comes from. It's difficult when I have to rush to put something down on paper, or the computer. I don't have time to do the necessary daydreaming, and that's what is keeping me from writing my best. So, that's about it for now, and until next week, my best wishes to you for your writing. If any of you have any experiences like mine, I'd love to read about them on my Fan Page on Facebook, or as a comment at the end of this post. If you have any questions you'd like me to answer about writing and publishing, or where I grew up, I'll try to answer as best I can. 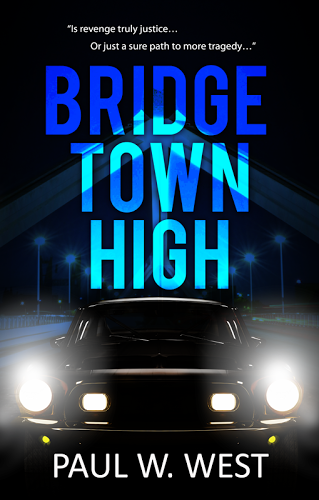 In the meantime, I'd love to have your email address so I can send you announcements of upcoming events like the blog tour / media blitz I am scheduling for the first or second week in October. 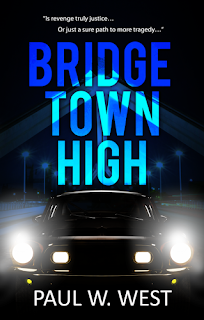 I will possibly reduce the price of my electronic version of my novel (BRIDGETOWN HIGH), so if you haven't got a copy yet, now would be a great time to buy one. You can also contact me at paulwwest@yaoo.com.